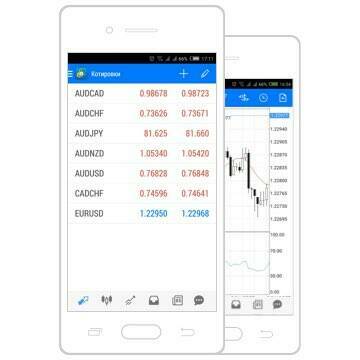 MetaTrader 5 Android is a full-fledged trading platform for Android OS powered devices.MetaTrader 5 Android is an opportunity for traders to download MetaTrader 5 platform on the devices powered by the popular Android OS. Complete set of traiding orders, trading history, interactive charts and the widest selection of supported mobile devices - all that is METATRADER 5 for ANDROID. Wherever you are and whatever you do, Forex will always be with you. Integrated charts provided by the Metatrader 4 Android will help you to determine current dynamics of symbol quotes, trading history will show you all your previous deals, while the powerful trading system will allow you to perform new ones. And all this can be done on the go with your MT4 for Android trading app. MT5 for Android System requires a smartphone or tablet PC powered by Android OS 2.1 and higher. Download MetaTrader 5 for Android on your smartphone or tablet and trade Forex anytime and anywhere in the world. To access your trading account you should install the trading app MetaTrader 5 for Android on your device with Android operating system, check the connection with the internet and choose the option "Login with existing account"
For opening a demo account or accessing the demo accounts, created from your Profile, please, choose “IFCMarkets-Demo” server. For accessing the real accounts, created from your Profile, please, choose “IFCMarkets-Real” server.